After valid.eu interruption, Vatlidator 2.1 is not longer retrieve VAT ID info. 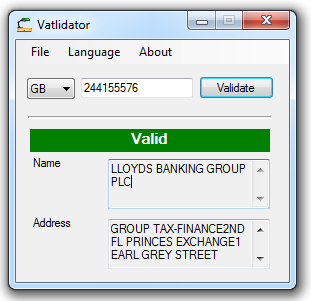 Now introducing the Vatlidator 3.0, a whole new validation and info tool for all the EU VAT IDs (AT, BE, BG, CY, CZ, DE, DK, EE, EL, ES, FI, FR, GB, HR, HU, IE, IT, LT, LU, LV, MT, NL, PL, PT, RO, SE, SI, SK), retrieving information directrly from the European Commision VIES SOAP Service. The new interface, now supports two languages, Greek and English. As its predecessor, is free software distributed under the terms of the GNU GPL 3 with installer and portable package available. For downloads, updates and more info see the program’s home page. After the indefinitely service interruption of the Greek Goverment’s GSIS DataBase system, this is an updated version, using the European Commission VAT Information Exchange System. It’s available the new version of Validator, the open source (GNU GPL3) desktop program, targeting .NET 3.5, for Greek VAT identification number (ΑΦΜ) validation, with support for receiving vatin’s holder info from the GSIS Gov Gr web service. Now it uses the latest versions of Multipetros.Validation.dll for the vatin validation, Multipetros.WebServices.dll for receive data and jQuery library for optimization of their presentation. Multipetros.Validation.dll is an open source library, for the .NET framework, with validation functionality for Greek Vies Vat IDs, Greek Social IDs and Luhn formula based numbers. ValidBlue is a small, open source, windows application for massive validation of Luhn Numbers, Greek Vies VAT IDs and Greek Social Security IDs, powered by Multipetros.Validation.dll and Multipetros.Props.dll libraries. Setup and Portable (zip archive) format are available. Both library and application distributed under the terms of FreeBSD license.